The War Memorial was erected as a fountain in memory of those who died in service or were killed in action during World War One. The fountain is no longer functioning. 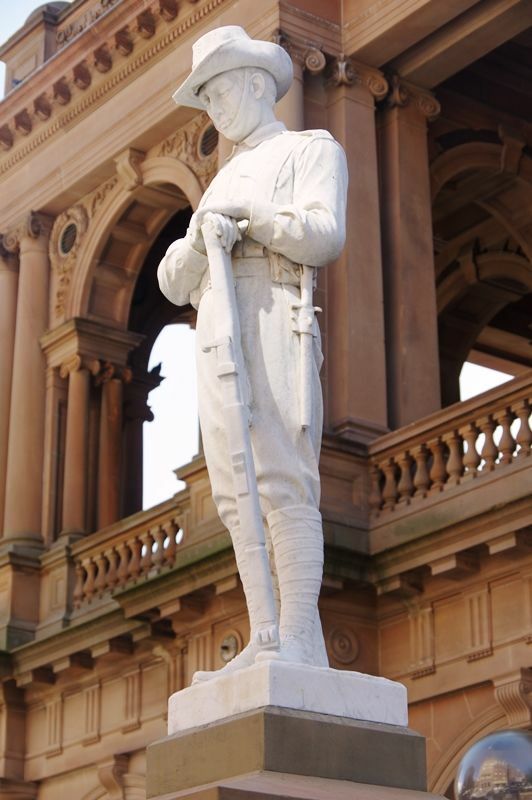 It is believed to be Australia`s first memorial to World War One that incorporated a soldier-statue. The foundation stone was laid by the Mayor on the 5th April 1916 less than one year after the landing at Gallipoli and the memorial was unveiled later that same year on 16 September. On the first anniversary of the ANZAC landing on 25 April 1916, marchers led by men wounded at Gallipoli, saluted the incomplete pedestal on their way to church services. Its erection was sponsored by a local resident and retired Naval Officer Commander Frank Gardner VD (Volunteer Decoration) while the pedestal and setting were designed by a local architect Edward Tingle. A local stone mason Thomas Brown carved the pedestal while the marble soldier atop the memorial was carved to order by an artisan in Italy. The soldier is carved with arms reversed and head bowed. The foundation-stone of the Gardner memorial to fallen soldiers at Newcastle was laid on Tuesday. This memorial consists of a fountain, upon which a soldier is to be erected. Tablets are to be placed on the sides of the memorial, and the names of those that have fallen in battle are to be inscribed thereon. It is expected that the memorial will cost about £500. The site selected is on the footpath in front of the post office, in Hunter-street. Farmer and Settler (Sydney, NSW), 5 April 1916. FOUNTAIN IN FRONT OF THE POST-OFFICE. The memorial was presented by Commander Frank Gardner, V.D., in "memory of the officers and men of Newcastle, who gave their lives to uphold the honour of the British Empire." 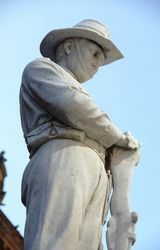 The lower part of the memorial takes the form of a fountain, while the upper part is the statue of an Australian soldier. The latter is of marble, and the work was done in Italy. The memorial was unveiled on Saturday last. Sydney Morning Herald (NSW), 20 September 1916. This Fountain Was Presented by Commander Frank Gardner V. D.